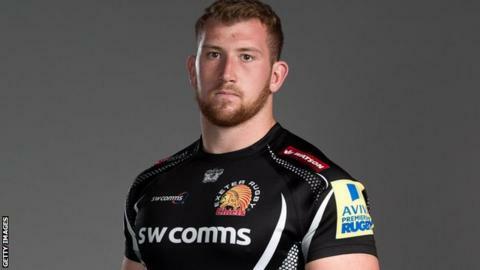 Exeter Chiefs prop Jake Woolmore has joined Championship side Jersey on loan as emergency front-row cover. The 25-year-old arrived in the island on Thursday after clearance from the Rugby Football Union for the move to ago ahead after the normal deadline. The islanders are without injured loose-heads Nacho Lancuba (leg) and Sam Lockwood (fractured arm). Woolmore has also agreed a permanent move to Jersey to follow the loan at the end of the current campaign. He signed for the Chiefs last summer, appearing in the A League and LV= Cup, and has also featured as a dual-registered player for former club Taunton Titans. "Jake will have to hit the ground running, but he's made an immediate impression at training," said Jersey head coach Harvey Biljon. "I'm hopeful he will be an asset to the squad straight away, as well as in the longer term when he joins us permanently in the summer." Woolmore is expected to go straight into the squad for Saturday's Championship game against Rotherham Titans, with the islanders still in with a chance of a play-off spot with three matches to go.